Pasties originated in Cornwall where the miners took them down into the mines. 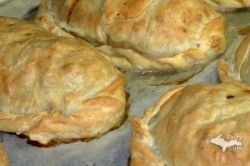 A pasty is a meat pie that may contain pork, beef, potato, rutabaga, carrots and onions baked in a light pie crust. A true Cornish pasty does not contain carrots. This dish came to the United State with the Cornish miners who settled in the Upper Peninsula of Michigan. There the other immigrant nationalities added their own variations. A Yooper pasty does contain carrots. Yooper is the name of the people who were born and raised in Upper Peninsula of Michigan (like me). Header image is of my home town of Copper Harbor in the Upper Peninsula of Michigan on the shores of Lake Superior.